It's that time of year again. Code4Life will be launching for the Fall 2018 semester in DC on Saturday, September. We'll be teaching in over 30 classrooms in Washington, DC, Seattle, Cleveland, and Baltimore, with around 400 students taking part in the program. That means we need instructors to cover all those classrooms. Code4Life differs from other coding programs such as Girls Who Code in that we use a paid instructor model. That means we go out and recruit, hire and train our instructors then send them to our participating schools to teach our AP computer science principles aligned curriculum. To see an overview of the curriculum, click here and here. If you know for sure you'd like to teach for us this fall, fill out our instructor questionnaire. It will provide us with all the information we need, and we'll be in touch with you within 48 hours of receiving it. If you'd like to learn more about teaching for us, check out the one page flyer called: Do Good. Get Paid. Thanks for taking a second to visit our blog. The new semester of Code4LIfe will begin the week of 3/4/19. If your school or recreation center or club would be interested in offering Code4Life at your location, contact Dave Oberting at dave.oberting@code4life.us or call him at 202.670.4403. 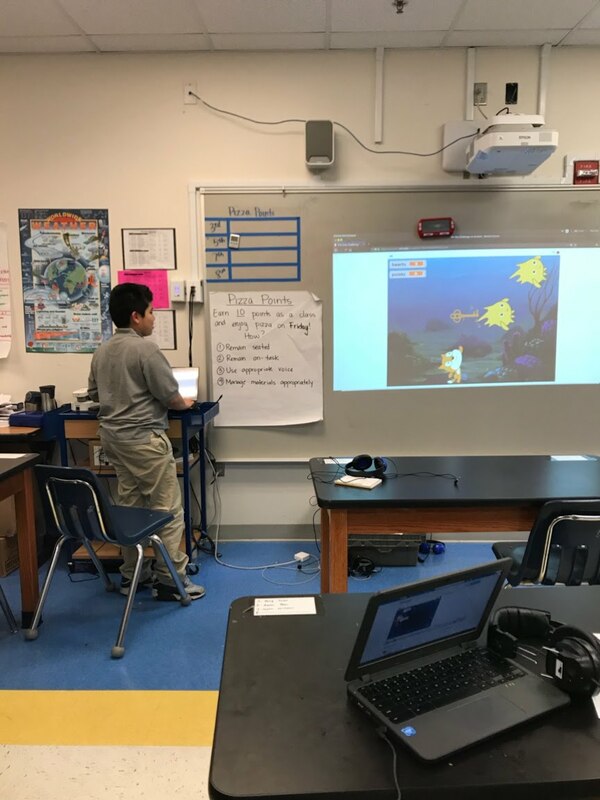 A Code4Life participant at KIPP Key Academy in DC demonstrations his animation project. The Spring 2018 semester of Code4Life is just about finished. We were excited to operate the program in 32 classrooms in Washington, DC and Seattle. We had about 400 students participate in the program this semester. Our summer camp starts 6/11 at BASIS PCS in Washington, DC, and the fall semester will start in mid-August. Thanks to all of our participants, school partners, and sponsors. Code4Life would not be a success without each of you. The largest and most obvious benefit of participating in Code4Life is that it improves academic performance. For details, click here. A team of Code4Life participants presents on their Scratch animation project. 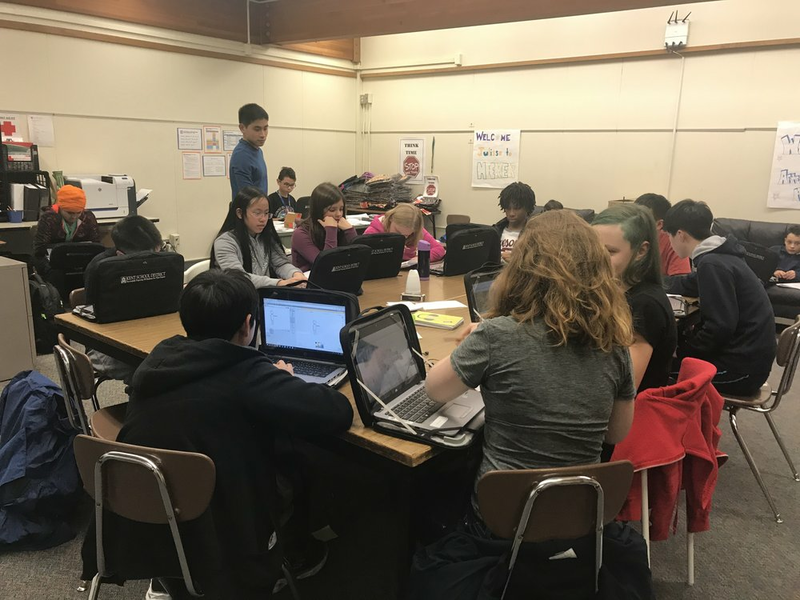 A student at Dimmitt Middle School in Renton, WA works on a program in Scratch. Code4Life, an after-school program that teaches basic computer programming skills to K-12 students from underrepresented backgrounds, will be launching for the spring semester in Seattle on January 6, 2018. 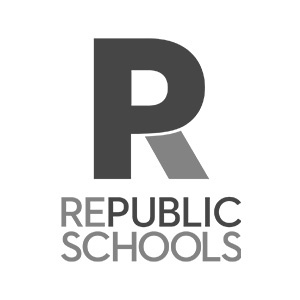 We are seeking instructors to teach our curriculum at our participating schools in the Seattle area. Code4Life differs from other coding programs such as Girls Who Code in that we use a paid instructor model. That means we go out and recruit, hire and train our instructors then send them to our participating schools to teach our curriculum, which is aligned to the AP computer science principles. To see an overview of the first unit of the curriculum, click here. If you would like to apply to teach Code4Life, fill out our instructor questionnaire. It will provide us with all the information we need, and we'll be in touch with you within 48 hours of receiving it. If you have any questions or would like to know more, email dave.oberting@code4life.us. Winners of the Code4Life competition at DC's Excel Academy. Code4Life is an out-of-school-time program created by the Economic Growth DC Foundation in partnership with Accenture that teaches basic computer programming skills to K-12 students across the country. It got its start at KIPP NE Academy in Washington, DC in 2013. The program has since expanded to over 25 schools in DC and even more in places like Cleveland, Baltimore, Philadelphia, Richmond and New York. We will be entering the Columbus market in the spring. First, our curriculum is aligned to the AP Computer Science Principles. Participation in our program is direct preparation for the for-credit computer science electives that will be available to them in the future. Second, we use a paid instructor model. Most coding programs rely on volunteers to teach their curriculum, but an all-volunteer model is difficult to sustain. Instead, we recruit, hire and train instructors, then send them to your facility to teach our curriculum. Our model provides for higher-quality instructors and more accountability. A semester consists of 16 hours of instructional time, which breaks down to two hours, after-school, one day a week for eight weeks. There are over a million computer programming jobs that go unfilled in the U.S. every year. The average starting salary for an entry-level computer programmer job that doesn’t require a four-year degree is $79,250. 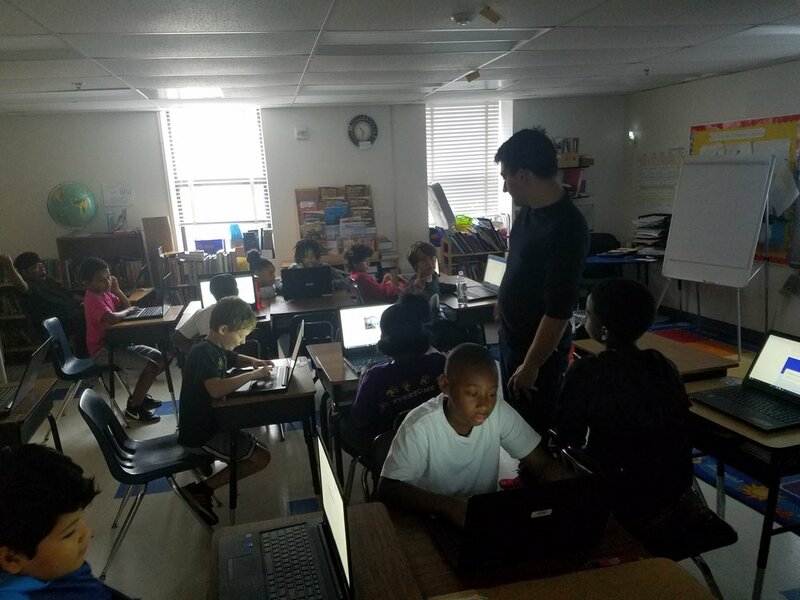 The primary benefit of participating in Code4Life at a young age is that it demystifies computer programming and opens the door to a career in computer science. There is also a study out of Brigham Young University that demonstrates that participating in a coding program improves academic performance. It teaches critical thinking, problem solving and logic. Coding has also been shown to improve test scores, especially in math. A students presenting her final project at Center City Congress Heights PCS. As Code4Life expands, it has moved from middle-school into high school and we are planning a full-time, 26 week, post-secondary boot camp style career training program that will lead directly to a job as an entry-level software developer. Students who participate in Code4Life from a young age will be granted preferential admission to the post-secondary program. For more information about the program, the curriculum and demographics, visit our website at http://code4life.us. If you have any questions about the program, please feel free to call me at 202.670.4403 or email me at dave.oberting@egdcfoundation.org. Dave Oberting is the executive director and founder of Code4Life. Code4Life continues into Week 3 (of 8). 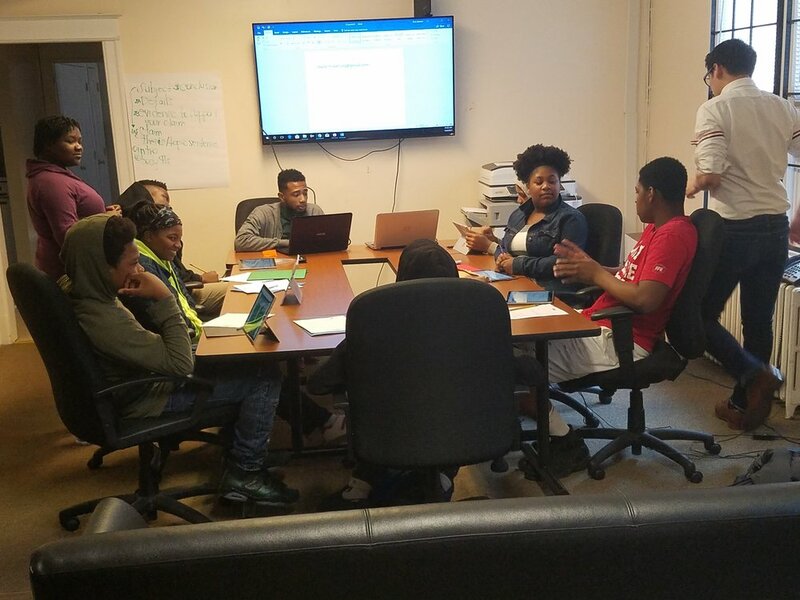 These pictures are from our two Saturday classes -- at Elsie Whitlow Stokes PCS, and the class at the United Planning Organization's office on Good Hope Road SE. Are you having a good time? More importantly, are you learning something? Code4Life instructor Mike Hassoun helping with complex movement and debugging. Code4Life is currently underway with about 450 participants in 28 classrooms at 21 DC public and charter schools, 2 DC recreation centers and the Kingman Boys & Girls Club. It's the largest K-12 STEM education initiative in the DC area and 90% of our participants come from underrepresented backgrounds and 60% of them are girls. For a one page overview, click here. Code4Life participants working hard at the United Planning Organization, a long-time partner. Code4Life launched today for the fall 2017 semester at Elsie Whitlow Stokes PCS in Ward 5. Mike Hassoun getting us started. Instructors Click here to access the instructions for getting started on Day 1 of Code4Life. A Code4Life participant presents on a project. A Code4Life participant presenting on his final project. Code4Life participants were thrilled to visit the Oval Office last week to take part in a ceremony in which President Trump directed the Department of Education to devote more resources to computer science education, including coding education. Our kids enjoyed meeting the President, Secretary Devos, Ivanka Trump and other officials. There's much more to do, but this was a great step. Just in the DC region, let alone around the country, there are thousands and thousands of young residents from low-income families that will not graduate from college. All of them need a set of skills that will allow them to earn a middle-class living and live a middle-class lifestyle. At the same time, there are thousands and thousands of software development and data science jobs that will be created over the next thirty years that will not require a four-year college degree, that pay on average more than $75,000, and will go unfilled every year for lack of qualified candidates. In fact, software developer is the single most in-demand occupation in the DC region and will be for decades. For more information, see this study from the the Metropolitan Washington Council of Governments called "Trends in Workforce Demand." After extensive research and testing, we have concluded that in partnership with our curriculum designers at the Bootstrap World program, it is possible to train effectively for these type positions in as little as six months. Our public and private sectors, together, must be able to train effectively for these occupations or those thousands of young DC residents will be looking at a life of diminished opportunity and a darker future. Code4Life is creating an intensive, full-time, 750-hour, 26-week post-secondary software development and data science career training and job placement program that will help low-income DC residents, age 18-25, prepare for, and be placed into entry-level jobs or apprenticeships as software developers and data scientists. The program will cost about $12,000 per enrollee over the course of the six month program. We have significant private sector backing from our various sponsors, but in order to fully realize the program's potential, we'll need a public private partnership with both the District and federal governments. We've made good progress with both the federal Department of Labor and the District's Workforce Investment Council, but we need to push them to do more. If you'd like to learn how you can help with that effort, email me at dave(dot)oberting@code4life.us. Code4Life is a program that teaches computer programming to young DC residents. 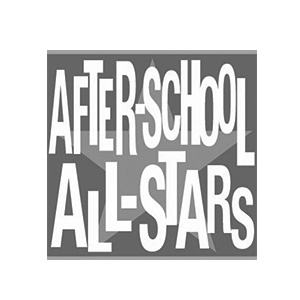 It was launched in 2013 as an after-school program focused on the middle-school grades. 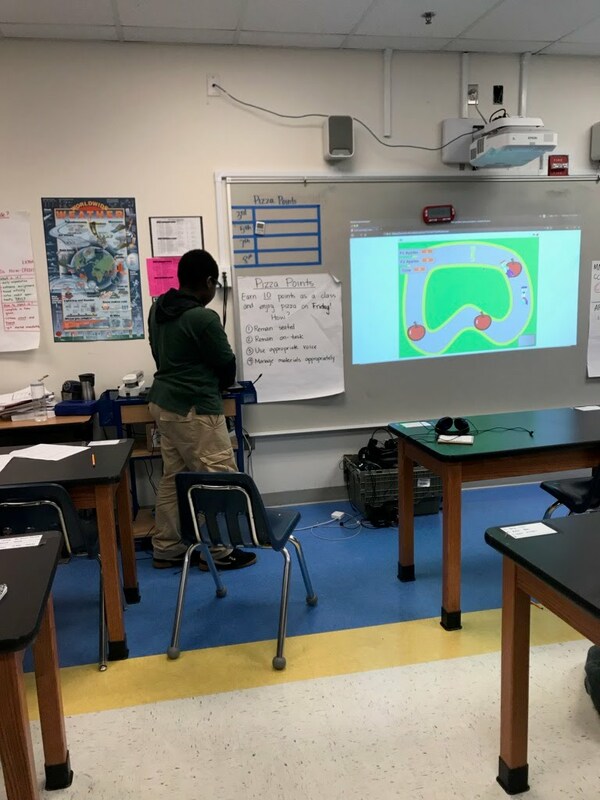 It's grown into the largest K-12 STEM education initiative in the District with around 400 students who took part in the program this past semester at 24 DC public and charter schools. We're currently expanding into high school and we're considering a full-time, 24 week, post-secondary software development career training program. It will take a young DC resident and teach them the skills they'll need to qualify for a position as an entry-level software developer and will help them find a meaningful job in the field. Students at Dimmitt Middle School in Seattle. Attached is a study out of Brigham Young University that demonstrates that a participating in a coding program improves academic performance. In addition to math skills, it teaches critical thinking, problem solving, logic and intellectual discipline. We'll be offering a summer session of Code4Life for the first time this year. The class will start on Monday, 6/26 and will run twice a week, from 5:00pm to 7:00pm for four consecutive weeks. If you are a software development professional, or a student majoring in computer science, we'd be interested in talking to you about teaching for us. Click here to view our flyer and follow the instructions. It's Week 2 of Code4Life. In this picture, instructor Collin Scott teaches students at KIPP NE Academy in NE the basics of HTML & CSS. 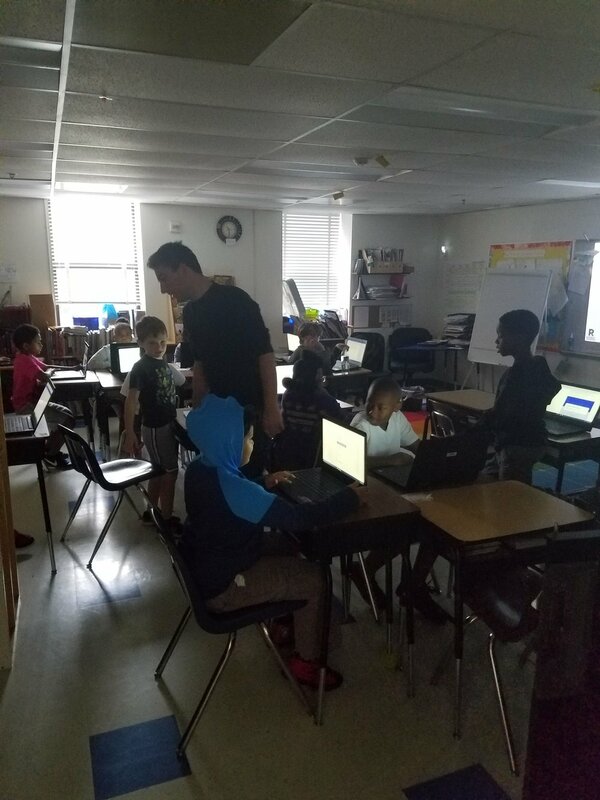 There are approximately 200 individual class sessions of Code4Life this semester in 25 classrooms at 22 schools and rec centers. Our first priority is a successful semester, which starts for us the week of March 13th and ends at the end of May. We'll be operating in close to 30 classrooms with around 400 students taking part in the program. 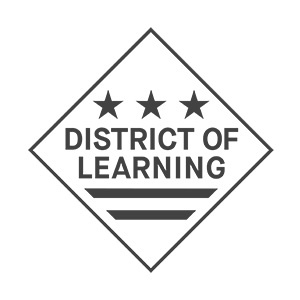 That includes the majority of the District's public and charter middle-schools, and we'll be piloting the program at two DC recreation centers. Our immediate enrollment goal is 750 students participating by the end of 2017. There was a study last year by the Metropolitan Washington Council of Governments that indicated that computer programmer is the single most in-demand occupation in the Washington region and will be for decades (see link below). Georgetown's Center for Education and the Workforce estimates that the DC region will create 350,000 hardware and software jobs between now and 2026. 110,000 of them will not require a college degree. Our primary long-term goal is to evolve into a pipeline of qualified candidates for those jobs in the DC region and to demonstrate that our particular model for teaching coding is stable and sustainable. Getting there will involve expanding into high school and some type of post-secondary certification system, upgrading our curriculum, developing better training for our instructors, expanding from 16 hours of instructional time per semester to 32, and creating the technology and other systems that would allow the program to scale at a reasonable cost. We also need to prove that the model can be replicated in other cities. We're also working on developing the appropriate data collection and assessment tools to be able to properly measure the impact of the program. There are a plethora of challenges that stand between us and these goals, but we're cautiously optimistic that we can get it done. Thank you for visiting the new Code4Life website. If it doesn't answer all of your questions, email me directly at dave.oberting@code4life.us or call me at 202.670.4403.